Over the weekend I was driving past Appleton Dock and found something interesting sitting on the wharf. It is a Sikorsky S-64 Skycrane helicopter fitted out for aerial fire fighting, owned by Erickson Air-Crane. Nicknamed “Marty”, the registration is N243AC. The first Skycrane fire fighting helicopter was brought to Australia in 1997, but it was the success of the helicopter named “Elvis” (registration N179AC) during the 2001-2002 fire season which brought Australian attention to their capabilities. 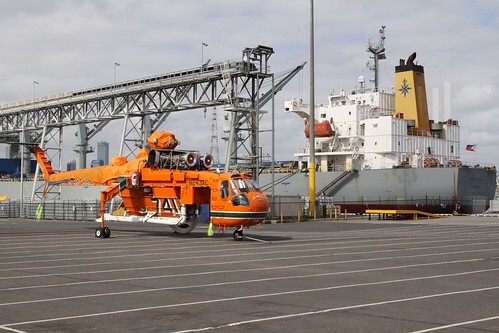 Since then, a number of other Skycranes have visited Australia during the summer to assist in the fight against bushfire. 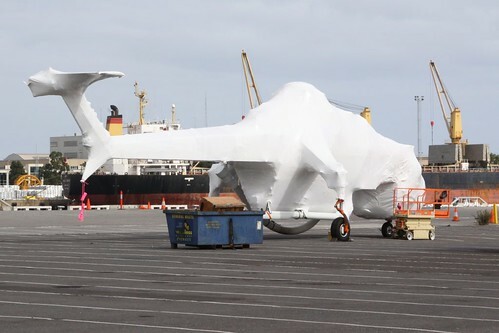 For transport by sea, the helicopters have their rotor blades removed to save space, then have a protective shrinkwrap applied to prevent corrosion at sea. 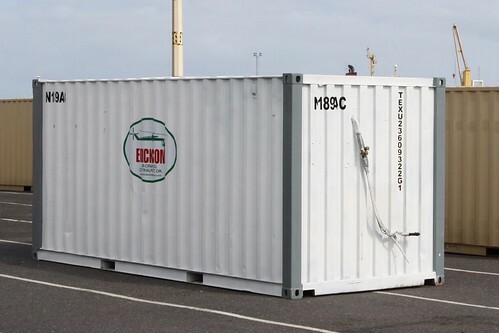 The other bits and pieces of the helicopter are packed into standard ISO shipping containers: the label on this box saw it has the parts of helicopter N189AC (nicknamed “Gypsy Lady”).